An opposition candidate has gone on hunger strike in the far east of Russia after suddenly losing a key regional election that he was poised to win. With more than 95% of votes counted in the Primorye region, the communist Andrei Ishchenko had a five-point lead. But during the night his pro-Putin rival Andrei Tarasenko overtook him. On Facebook Mr Ishchenko urged his supporters to protest in Vladivostok, saying "our votes are being stolen". The communists are taking legal action. Mr Ishchenko said the party's legal service was preparing formal protests over the results in several districts: Artyom, Ussuriysk, Nakhodka, and Sovietskiy, which is in Vladivostok. "We won't go away until we see fair election results!" he said. Russia's best-known opposition leader, Alexei Navalny, also called for a mass protest in Vladivostok. Navalny is serving 30 days in jail for organising an unauthorised protest earlier this year. He was sentenced on 27 August. In a statement on his blog on Monday (in Russian) he denounced Primorye's "brazen falsification of the election results", calling it "an insult not just to the region's residents, but to the whole country". In a tweet, fair elections campaign group Golos reported that Mr Tarasenko, the current acting governor, had suddenly surged ahead when more than 99% of votes had been counted in Primorye. The vote was a second-round runoff, because no candidate had passed the 50% threshold in the first round. President Vladimir Putin had held talks with Mr Tarasenko in Vladivostok last week, but did not meet the other candidates. Mr Putin told him: "I know you are facing a second round [vote]. I think everything will be fine". The transcript was published (in Russian) on the Kremlin website. 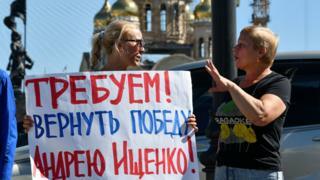 There have been widespread street protests over the Kremlin's decision to raise the pension age. Last month the issue pushed support for Mr Putin down to 64%, from 80%, state pollster VTsIOM reported. What exactly happened in Vladivostok? The voting drama early on Monday culminated in firefighters turning up at the election commission building in Vladivostok's Sovietskiy district. Communist officials accused the commission there of falsifying ballot papers and delaying issuing the results. They said the party's observers in the building had refused to leave, at which point firefighters turned up, saying they had to evacuate people because of a suspected fire on the third floor. BBC Russian reports that similar "emergencies" happened at some other vote-counting centres. Police cordoned off the election commission building in Ussuriysk. Politicians were then refused entry. Communist observers declared a hunger strike in the commission building in Artyom, after officials refused to release the results there.